Recently I had the opportunity to work on the pilot episode of a new NHK World train travel program as script adviser. The program’s traveller, Nick Szasz, rode a steam train and two other trains from Kumamoto to Kagoshima in Kyushu. The aim of the program was enjoying the journey, not just the destinations. You have slow food, and you have slow travel. The latter is something I have been enjoying myself, lately. When translating the script I watched the rough cut DVD numerous times. That sure is a tough job when you consider Szasz is enjoying all the local cuisine, micro-beers, sake and shochu (Japanese vodka). I longed to go on a long train trip myself after watching him talk with other travellers, railway employees and the locals. The Japanese version first appeared in the June 2013 issue of the goodspeed monthly newsletter. 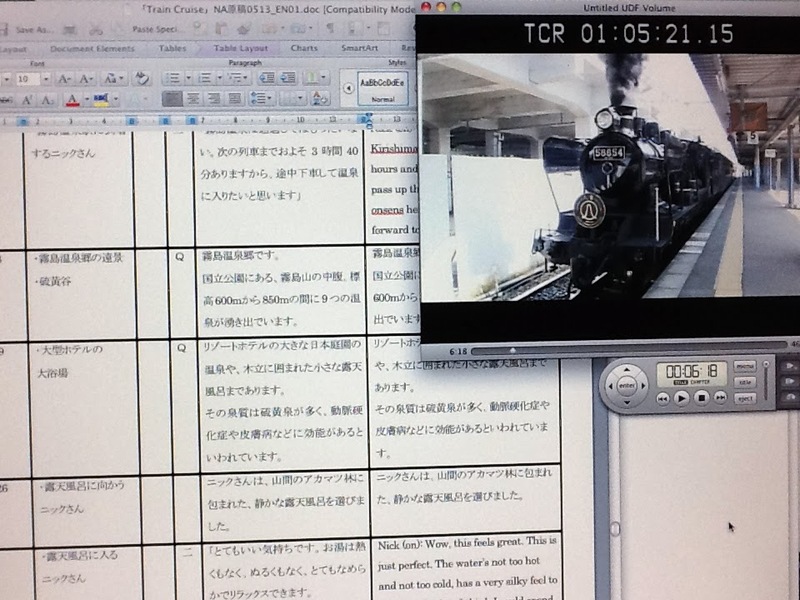 Footnote: [January 2014] I again had the opportunity to work as script adviser to the fourth episode of Train Cruise "A Fall Trip from Kyoto to the Japan Sea" to air on NHK World, February 1, 2014. After many years of working in-house in Japanese corporations, I now work as a professional Japanese-English translator, interpreter, writer, event promoter, narrator and local facilitator.